Toyota is moving ahead of other auto manufacturers by taking responsibility as a global clean air leader. In October 2015 Toyota presented a plan to remove their carbon footprint by challenging themselves to reduce vehicle CO2 emissions by 90% of their 2010 levels by 2050. 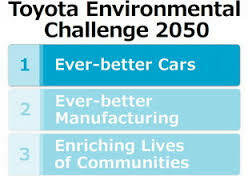 The long term plan is to eliminate their carbon footprint in Toyota cars and auto production using the six stages of their Toyota Environmental Challenge plan. 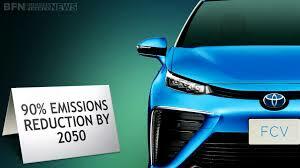 The first challenge is the New Vehicle Zero CO2 Emissions Challenge. In this stage Toyota will develop and accelerate the production and sales of the next generation of cars with low or zero CO2 emissions. These include hybrids, plug-in hybrids, electric and fuel cell cars. They also will provide support in developing an infrastructure to maintain and promote widespread adoption of these vehicles. The second challenge is the Lifecycle Zero CO2 Emissions Challenge. In this stage Toyota will reduce CO2 emissions in the materials used to produce their autos, in the actual production process of the cars and they will also produce Toyotas which emit less CO2 when driven. In the third stage, the Plant Zero CO2 Emissions Challenge, Toyota will adopt renewable energy sources such as solar and wind, improve manufacturing technology and reduce the time it takes in the production of vehicles. Challenge four is Minimizing and Optimizing Water Usage. In this stage less water will be used in auto production. They will also implement a rainwater collection system, re-use wastewater through recycling and set up a system to purify the water used and return it to the environment. Challenge five will Establish a Recycling-based Society and Systems and will consist of four key areas: (1) utilization of eco-friendly materials; (2) making use of parts longer; (3) development of recycling technology; and (4) making vehicles from the materials of end-of-life vehicles. Challenge six will Establish a Future Society in Harmony with Nature. Toyota will engage in planting trees, environmental conservation around their manufacturing facilities and take part in environmental education programs. Toyota states that these goals are to challenge themselves in creating a healthier planet. It’s time all manufacturing industries took up this challenge and helped in the effort to save our planet! Clean up our planet by slashing CO2! Categories: Building Green, Climate Change, Electric and hybrid vehicles, Energy Programs, Sustainable Education | Tags: Climate change, Renewable energy, Renewable Resources, Solar power, Sustainable energy | Permalink.